Check out this photo. This is the freeway-cam, looking at Interstate 405. At 1:42 am this morning. We had some snow, and the streets were very wet — and there was a rather quick temperature drop which then turned everything to ice. So I guess this is the result. I-5 was just as bad at 1am, but by 1:42 it had started to clear up a bit. I wonder if some of these folks were going home from tonight’s Seahawks game, or even worse, if they were coming home from work and were stuck there for about 5 hours. I don’t know, but it was ugly for hours and hours, at least. I missed this article when it was posted on Orcinus a month and a half ago, but it is well worth reading. A “health-care-card-carrying Canadian resident and uninsured American citizen who regularly sees doctors on both sides of the border” addresses the myths and truths about Canadian-style health care. Now that we have some Democrats in office I’d love to see a push toward a single-payer system, but I don’t have much faith it can happen. But it should. My feet are always cold in the winter. So warm wool socks are a priority. Having a kitten around put a damper on the knitting for a while, but I’ve finally managed to get some knitting done. 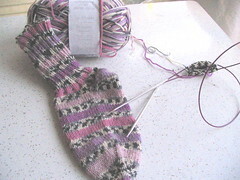 Here’s one sock out of a pair, and the toe of the second sock just getting started. Technical info for the knitters: the circular needle I am using is one of the new Knit Picks needles, and it is great. The join is perfectly smooth (important because I knit tightly) and the cable is nice and flexible. The needles themselves are very, very slick. In fact, if you are a loose knitter, they might be too slick for you. But for me, that is perfect. The yarn is by On Line and it is their 6-ply sock yarn, so I get to knit it with large needles — US 5 in this case. So I started the sock a few days ago and it is already done. This thickness of sock fits just fine in most of my shoes, so I think I should knit more of these 6-ply socks. The speed at which I can produce a sock this way is really nice. I am a slow knitter so every little bit helps. 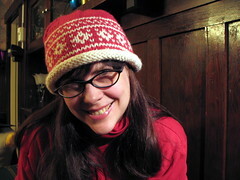 The yarn is self-striping (as you can see) but the quality of the striping pattern is very nice — consistent stripe sizes, and the pattern is wide colored stripe, followed by one round of wide pale gray and white blocks, followed by a wide faux Fair Isle black and white section, followed by one round of wide pale gray and white blocks, then back to the color. The single row of grey and white is a nice effect that makes the socks look more like a real striped pattern as opposed to typical self-striping socks which can look a little sloppier sometimes. 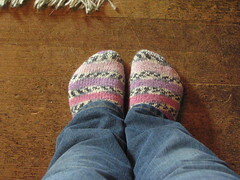 The socks are toe-up with a short row heel. 52 stitches around through the foot and the ankle (I have wide feet and ankles), and 2×2 rib on the ankle. Me in a V for Vendetta costume on Halloween. It is possible that I get too much into the Halloween thing. A V mask scares the crap out of small children who are trick-or-treating. …but only if I do well on the exam this week, which is taking many many hours of my time. Sherman, our 5.5 month old kitten, has finally calmed down enough from his psycho-kittenness so that I can occasionally knit (photo coming soon). Before he would attack the needles immediately so I got absolutely no knitting done for a couple of months. There was an election this week and HOLY CRAP IT ACTUALLY WENT OUR WAY FOR ONCE. I really want to get that cat pics post off the top of the blog! Now I just need to get some more of this exam done by the deadline. In the meantime, here’s a holiday song and some drummer jokes to boot!